When it’s the first cookie out of a fresh bag, you are consoled by the weight of all the other cookies you are still holding. When it’s the last one all you can do is stare at it longingly. Imagining all the good times you never had. You were going to make to Paris one day! Also, if you love comic strips and cartoonists like I do you’ll want to check out this Kickstarter for an amazing documentary called STRIPPED. Lots of traditional newspaper and new webcartoonists are included. It’s gonna be so great! Are you gonna eat that? Can I have it? 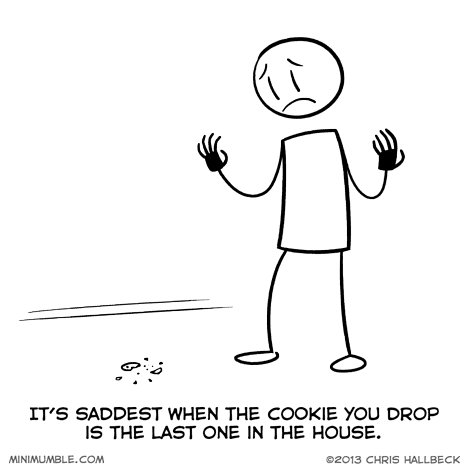 Dropped cookies never hit the floor in my house. We had a Labrador Retriever. Okay, that comment officially wins you one internet.